Mount Vernon, NY, August 13, 2018 – Wartburg, Westchester’s premier provider of comprehensive residential and healthcare services for seniors, hosted the Tony-nominated Broadway star of Carousel, Renée Fleming. Wartburg President & CEO, David J. Gentner, the Institute for Music and Neurologic Function Executive Director, Dr. Concetta Tomaino, Wartburg board member, Ulrich J. Rosa, and other senior staff met with Ms. Fleming in an effort to highlight the importance of music and arts on Wartburg’s campus. greeted by registrants singing as piano music filled the room. 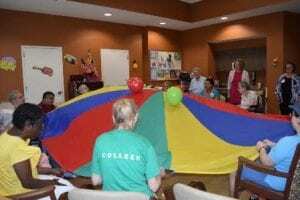 Additionally, she learned about the innovative music therapy services offered by the Institute for Music and Neurologic Function (IMNF) and Wartburg’s award-winning, internationally recognized arts-based therapy program, Creative Aging & Lifelong Learning. She also visited Wartburg’s Outpatient Center to hear about innovative programs using music to improve mobility and speech impairments. Ms. Fleming is a world renowned Soprano and four-time Grammy Award winner. In 2013, then President Obama awarded her the National Medal of Arts, America’s highest honor for an individual artist. Ms. Fleming is a longtime advocate for the transformative power of music, including its therapeutic uses for individuals with neurologic issues. In 2016, she initiated a partnership between the National Institute for Health and the John F. Kennedy Center for the Performing Arts focusing on the intersections of music and the brain and is a spokesperson for the American Music Therapy Association. Fleming’s visit ended with President Gentner reading a proclamation making Ms. Fleming an honorary member of the Wartburg family. Share what's happening at Wartburg!